Padre Pio had a human aspect. He appears like others in the civilian registers. He is a fellow countryman and a contemporary of our own, born into a certain family, into a certain society, which gives him an identity card like any other citizen. But on the other hand, he appears as one destined to serve a divine purpose, sent as it was, to be a lightning conductor to protect us, as one who is merely lent to us here below to attend to the matter of our salvation. Bilocation is the phenomenon in which a person is in one place at a given moment and is in another place at the same time. Although bilocation is indeed rare, instances of it in the lives of the saints are well‑documented. Nevertheless, it remains a mystery that cannot be fully explained, and in many ways it seems to be beyond the limits of human understanding. There is little doubt that Padre Pio had the extraordinary gift of bilocation. During his lifetime, although he remained inside the monastery of Our Lady of Grace, he was observed at times, in many different parts of the world. He was reportedly seen at the canonization of St. Therese of Lisieux in Rome in 1925. He also hinted that he sometimes went in spirit to the Holy House of Loreto, a shrine that he often encouraged people to visit. Located in Loreto, Italy, it is one of the most revered Marian shrines in the world. The Capuchins who lived with Padre Pio often wanted to question him about his gift of bilocation, but were reticent to bring up the subject. In 1931, Father Agostino presided at a ceremony for religious profession in a Carmelite convent in Florence. One of the nuns who lived at the convent told Father Agostino that Padre Pio had appeared to her in bilocation. One day, Father Agostino, who was very close to Padre Pio, decided to ask him about it. “Do you sometimes take little trips to Florence?” he asked. “Sometimes I do,” Padre Pio replied. The nun also told Father Agostino that she begged Padre Pio to make a visitation to one of the other Sisters in the convent, Sister Beniamina. “No, I cannot visit her,” Padre Pio replied. “I do not have God’s permission.” When Father Agostino asked Padre Pio if he had made such a statement to the nun, he admitted that he had. Father Eusebio Notte served as Padre Pio’s personal assistant for five years. Father Eusebio had an outgoing and engaging personality and a good sense of humor. When Padre Pio was feeling unhappy or ill, Father Eusebio was almost always able to cheer him up and bring a smile to his face. He seemed to know just the right words to say. The other Capuchins marveled at the wonderful rapport that Father Eusebio had with Padre Pio. Padre Pio appeared in bilocation to his personal physician, Dr. Andrea Cardone of Pietrelcina, on several occasions. Dr. Cardone left a written testimony regarding the details. One of the visitations occurred on September 23, 1968 at six o’clock in the morning. Padre Pio had passed away approximately four hours before. Padre Pio once told Father Alessio Parente, “I only know one thing, I go wherever God sends me.” On another occasion, he said to Father Pellegrino Funicelli, “All I can tell you is that I always try to remain attached to the thread of God’s will.” Through the gift of bilocation, Padre Pio was able to visit many of his spiritual children who were in great need of his help. He comforted those who were bereaved, came to the rescue of those in danger, and assisted the dying. It was part of his mission to souls. He truly remained conformed to the thread of God’s will. Padre Pio was a seventeen-year-old Capuchin student residing at the monastery of St. Francis of Assisi at Sant’ Elia a Pianisi when he had his first experience of bilocation. It happened on the evening of January 18, 1905. He was praying in the choir loft of the monastery church at eleven o’clock in the evening with a fellow Capuchin, Brother Anastasio. Suddenly, Brother Pio found himself in a large and beautiful estate in a faraway place. There, he ministered to a man who was dying. In the same house, a baby girl had just been born. The Virgin Mary then spoke to Brother Pio and said, “I entrust this child to your care. She is a precious jewel. I want you to polish her and make her as brilliant as possible because one day I want to adorn myself with her.” “But how can I do that?” Brother Pio answered. “I am a simple Capuchin Brother. My future is uncertain. I do not even know if I will be ordained. And besides, how could I take care of a child?” “You will see,” the Virgin replied. “She will come to you. You will meet her at St. Peter’s Basilica in Rome.” The Virgin then vanished and Brother Pio found himself once again seated beside Brother Anastasio in the church. Brother Pio knew that he had not fallen asleep in the monastery chapel and dreamed about the incident that had just occurred. He also knew that the experience had not been a product of his imagination. Nor was it an hallucination. But as to what had really happened, he did not know. The experience was so strange that he decided to write down all of the details. He gave his written testimony to Father Agostino. As it turned out, the beautiful home that Brother Pio suddenly found himself in was the home of Giovanni Rizzani. It was located about three hundred and fifty miles away in the city of Udine, in northern Italy. Giovanni had been suffering for many months from a terminal illness. The night of Brother Pio’s visitation, Giovanni was on his death bed. During Giovanni’s illness, he had informed his wife Leonilde that he did not want a priest to come to visit him. Giovanni had a great hostility toward religion. His friends kept a watch to make sure that no members of the clergy approached the house. Leonilde Rizzani was a fervent Catholic. Her greatest desire was that her husband make peace with God before his death. She prayed to God and asked him to change her husband’s heart. When Giovanni seemed to be near the end, Leonilde begged the Lord for his salvation. As she was praying, she saw a young Capuchin monk. She could not understand what was happening because he appeared and then he seemed to disappear right before her eyes. 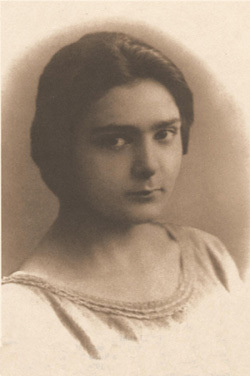 A photo of Giovanna Rizzani when she was eighteen years old. Leonilde, at that time was pregnant. In those anxious moments, she went into premature labor. Soon she gave birth to a baby girl. A friend of the family noticed that a Capuchin monk was standing in the darkness just outside of the Rizzani house. He insisted that the Capuchin be allowed inside. He knew that Giovanni had given specific orders against letting any clergy members in the house. However, it seemed only right to allow the Capuchin to come inside and baptize the newborn baby. As soon as the Capuchin stepped inside the house, he went directly to Giovanni’s room. No one tried to stop him. He spoke to Giovanni privately. Before the visit was over, Giovanni asked for forgiveness for his sins and made his peace with God. He died later that night. After Giovanni passed away, Leonilde decided to move with her new baby, Giovanna, to Rome. In 1922, when Giovanna was a teenager, she visited St. Peter’s Basilica in Rome. At the Basilica, Giovanna was hoping to have the opportunity to go to confession. She had been having many doubts about her faith and she felt that her spiritual life was in a precarious state because of it. She wanted to talk to a priest and ask for advice. However, St. Peter’s was about to close so she realized that she would have to wait for another opportunity. Giovanna was just about to exit the church when she saw a Capuchin priest standing near one of the confessionals. She asked him if he would hear her confession and he agreed to do so. The priest heard her confession and also gave her excellent spiritual counsel regarding her doubts about the faith. After Giovanna left the confessional, she told the sacristan that she wanted to wait for the priest to come out so that she could ask him his name. Giovanna waited but the priest did not come out. Finally, the sacristan looked in the confessional and found that it was empty. The following year, Giovanna made a trip to San Giovanni Rotondo. She stood in a crowded corridor with many others who were waiting to greet Padre Pio. When he passed through the corridor, he noticed Giovanna. He said to her, “Daughter, I know you. On the very day that your father died, you were born.” Giovanna did not know what to make of his words. The next day, Giovanna returned to the church and was able to make her confession to Padre Pio. Lovingly, Padre Pio told her that he had been waiting for her for many years. Giovanna thought that he had mistaken her for someone else. Padre Pio went on to explain to her that he was the priest who had heard her confession the year before in St. Peter’s Basilica. “You belong to me, daughter. You have been entrusted to me by the Madonna,” he said. Giovanna was later able to read the statement that Padre Pio had written and had given to Father Agostino regarding his experience of bilocation on January 18, 1905. Giovanna noted that everything in the letter was accurate according to her birthdate as well as her family history. Padre Pio told Giovanna that he wanted her to visit San Giovanni Rotondo often. Through the years she was able to attend Padre Pio’s Mass on many occasions and to make her confession to him. He encouraged her to enroll in the Third Order of St. Francis and she did so. He truly took care of her soul. A short time before Padre Pio’s death, Giovanna felt in her heart that he was calling her to come to San Giovanni Rotondo. Just four days before he passed away, she was able to talk with him. “You will not see me again,” he said to her. She then understood that it was to be their last visit. Giovanna knew that for many years, she had been spiritually guided by a saint. She was aware that she had been blessed immeasurably. “I will be able to help you much more when I am in heaven,” he frequently repeated to his spiritual children. In 1905, Father Benedetto Nardella was Padre Pio’s professor of philosophy at the Capuchin monastery in San Marco La Catola. 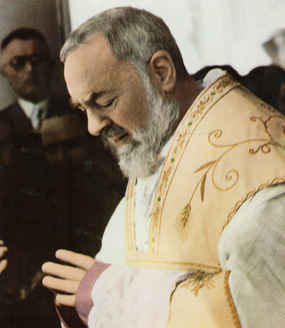 At that time, Padre Pio was a student in formation for the priesthood. Father Benedetto was a popular and gifted teacher as well as an author, theologian, and preacher. His preaching ability was so outstanding that he was in great demand in many parts of Italy. He was also an extraordinary spiritual director and his reputation for holiness increased with the passage of time. He was eventually elected Minister Provincial of the Capuchin order. Father Benedetto was to become Padre Pio’s first spiritual director. He accompanied Padre Pio step by step on his spiritual journey and helped him in incalculable ways. Padre Pio often said that Father Benedetto understood his soul like no other. He considered Father Benedetto to be his “true teacher” in the ways of the spirit. After Padre Pio was ordained to the priesthood, he too became a spiritual director to a number of people who were seeking a closer union with the Lord. Whenever he was praised for his ability to direct souls, he referred all the credit to Father Benedetto. He used to tell people that he had received his training from Father Benedetto. In 1922, Padre Pio’s fame as the “priest with the stigmata” was spreading rapidly. Some members of the clergy became jealous of Padre Pio and resented his popularity with the laity. They went to great lengths in their efforts to discredit him.That year, many severe restrictions were placed on his ministry by the Holy Office in Rome. One directive called for the dismissal of Father Benedetto as his spiritual director. No clear explanation was ever given as to the reason for the decision. The two Capuchins were ordered to cease all communication with each other. Father Benedetto had been Padre Pio’s spiritual director for twelve years. The news was a crushing blow to both priests but especially to Padre Pio, who depended on Father Benedetto’s excellent spiritual counsel. Nevertheless, the two priests obeyed the directive without a complaint. In the years that followed, whenever Father Benedetto passed through San Giovanni Rotondo, he would mentally send Padre Pio his blessing. Always obedient to the voice of the Church, he made no attempt to visit him. Father Benedetto was living at the Capuchin monastery in San Severo in 1942 when he became gravely ill. Father Aurelio, who was the superior of the monastery at the time, stayed at his bedside during what proved to be his final illness. He asked Father Benedetto if he would like him to send for Padre Pio. Under the circumstances, it could be easily arranged. It had been twenty years since Father Benedetto and Padre Pio had last seen each other. “There is no need to send for Padre Pio,” Father Benedetto replied. “He is right here beside me.” Shortly after saying that, Father Benedetto passed away. Father Carmelo Durante of Sessano used to go to Padre Pio’s cell in the evening to say goodnight to him. One time, as he bid Padre Pio goodnight, Padre Pio said to him, “I am in a hurry because I must make a long journey tonight.” “Where are you going?” Father Carmelo asked. Padre Pio made no reply. There was a moment of silence and then Padre Pio added, “To make this journey, I do not need the permission of my superior.” At the time, Father Carmelo was the superior of Our Lady of Grace monastery. So it was that Padre Pio, with a bit of humor, hinted to Father Carmelo that he was going to visit someone through bilocation. He would say no more. Once, in the monastery dining room, Father Carmelo was speaking to his fellow Capuchins about the marvels of air travel. “Do you know that a nonstop flight from Rome to New York takes less than twelve hours?” Father Carmelo said. The information seemed incredible to all of the Capuchins. But Padre Pio was not impressed. “That is a long time!” Padre Pio remarked. “It only takes a second when I travel,” he added. In 1954, Father Carmelo was making a detailed study of Padre Pio’s first years in San Giovanni Rotondo. In order to gather information, he organized some meetings with Padre Pio’s spiritual children who had been with him from the beginning. He met with Rachele Russo, the Ventrella sisters, the Pompilio sisters, Filomena Fini, Rosinella Gisolfi, Nina Campanile and others. During the first meeting, there were ten people in attendance. While the meeting was in progress, Rosinella Gisolfi whispered that she could see Padre Pio in the room. Rosinella, who had received spiritual direction from Padre Pio through the years, was a very devout woman. Father Carmelo was certain that she was telling the truth. He had no reason to doubt it. But he wanted confirmation regarding Rosinella’s claim. Father Carmelo did not want to ask Padre Pio directly about the bilocation incident. When he returned to the monastery, he asked the Capuchins about Padre Pio’s activities that evening. They told him that Padre Pio had conducted the Benediction service in the church just like always and that he had spoken to some visitors. After that, he went to bed. At Father Carmelo’s second meeting with Padre Pio’s spiritual children, Rosinella saw Padre Pio once again. Father Carmelo decided to speak to Padre Pio about it. One day he gathered up his courage and said to Padre Pio, “Rosinella said that you . . . ” and then he trailed off. He lost his nerve midway through the sentence. “What did Rosinella say?” asked Padre Pio. With a great effort, Father Carmelo was finally able to blurt out the words, “Rosinella said that you are present at our meetings through bilocation.” “Well, don’t you want me to come to those meetings?” Padre Pio asked. As usual, his words were evasive. Pope Pius X was distinguished by his extraordinary charity and kindness, especially his habitual generosity to the poor. At his own expense, he filled the Vatican with refugees from the devastating earthquake of 1908 in Messina, Sicily. His decision to help the displaced people came long before the Italian government had decided on an action plan. Pope Pius X was buried in a simple and unadorned tomb in a crypt below St. Peter’s Basilica in Rome. Shortly after his death, the faithful began to make pilgrimages to his tomb. Accounts of miraculous favors and cures were soon reported. Miracles and healings had been reported during his lifetime as well. On May 29, 1954, Pius X was canonized by Pope Pius XII. Padre Pio always had a great love for Pope Pius X. He spoke of him often and with profound reverence. It was common knowledge that Padre Pio did not leave the monastery of Our Lady of Grace in San Giovanni Rotondo. However, on a number of occasions, people reported that they saw Padre Pio praying at the tomb of Pope Pius X in Rome. Pope Pius XI had heard the reports on more than one occasion and did not know what to make of them. He decided to ask the saintly priest, Father Luigi Orione, for his opinion on the matter. Brother Costantino was a lay brother who lived at the monastery of Our Lady of Grace in San Giovanni Rotondo. Padre Pio admired him for his Franciscan humility and simplicity and for his strong faith. Every day Brother Costantino went to town to collect donations for the monastery. Many times, people asked him to carry a message to Padre Pio and he was always glad to do so. By the same token, when he returned to town, he was usually able to bring a reply from Padre Pio. In 1958, Brother Costantino became ill and was admitted to the Home for the Relief of Suffering. He had just recently celebrated fifty years of religious profession. Padre Pio had presided at the ceremony in which Brother Costantino renewed his vows to the religious life. One day, a man who had visited Brother Costantino at the hospital spoke to Padre Pio and said, “I think Brother Costantino would be very pleased if you would go to the hospital and visit him. It would mean so much to him.” Padre Pio told the man that he had already been to the hospital to visit Brother Costantino. Father Giovanni, one of the Capuchins, happened to be standing nearby and overheard the conversation between the man and Padre Pio. He was certain that Padre Pio had not been over to the hospital to pay a visit to Brother Costantino. Because of Padre Pio’s popularity, it was an “event” whenever he left the monastery and it always created quite a sensation. People generally talked about it for days. If Padre Pio had been visiting Brother Costantino at the hospital, Father Giovanni as well as the other Capuchins, would have been the first to know. Father Giovanni went to the Home for the Relief of Suffering and spoke to Brother Costantino. “Has Padre Pio been here to visit you since your hospitalization?” he asked. “Oh, yes,” Brother Costantino replied. “He comes two or three times every day to see me. It is a great consolation to have him at my bedside. He gives me resignation.” Brother Costantino knew that his end was near. Padre Pio loved Brother Costantino very much. Through bilocation, he was able to console his Capuchin Brother. He helped him to accept his death in a true spirit of resignation to God’s will.